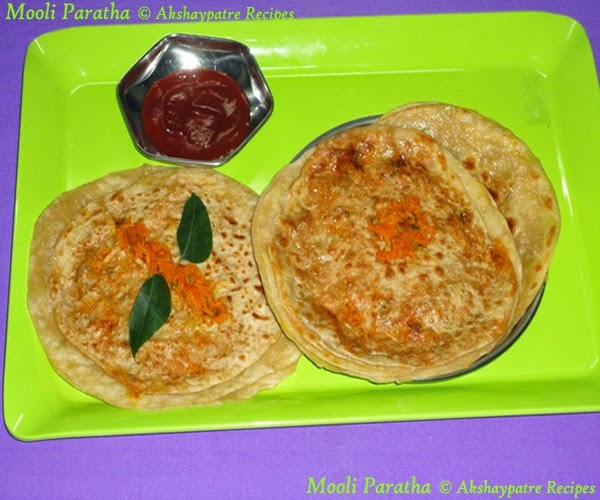 Mooli paratha recipe- Mooli paratha is a healthy and tasty variety of paratha. It is easy to prepare using the method I have mentioned above. You may think that mooli paratha may have a pungent odour. However, this is not true. To be sure you can try the following step by step method once and see for yourself. 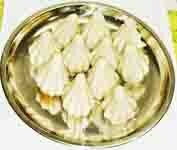 It is odourless and as tasty as any other paratha. 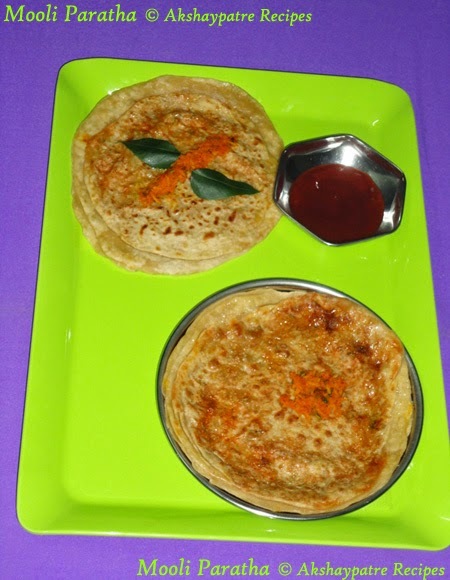 This delicious mooli paratha is ideal for breakfast, lunch and dinner. It goes well with curd, chutney, pickle and tomato ketchup. Mix together the wheat flour and maida. Add salt to it. Knead it to a soft dough of rolling consistency. The dough should be very soft. Cover it with lid and keep it aside till you prepare filling mixture. Peel and grate the radish. Sqeeze out the water from the grated radish. Add all the ingredients mentioned under "for the filling" and mix with the grated radish. Heat little bit of oil in a pan and add radish to it. Stir the radish mixture on a medium flame and heat it till the radish become soft. Divide the dough into 20 equal portions. Roll out the round poori sized rotis from it. Spread 2½ to 3 tbsp of radish mixture on one roti. Place another roti over it. Press the edges gently and slightly pat the paratha with your finger tips. Then gently roll the rolling pin over the paratha and remove the finger marks. Repeat the same process to all other parathas. Now heat the tawa/griddle and smear ¼ tsp ghee/oil on it. Place the rolled paratha on the tawa. Pour ¼ tsp ghee/oil on the paratha. Again spread ¼ tsp ghee around the paratha. Shallow fry the paratha till golden brown from both sides. Transfer to a serving plate, apply ghee and serve hot with choice of your side dish. 1. Peel and grate the radish. Sqeeze out the water from the grated radish. Add all the ingredients mentioned under "for the filling" and mix with the grated radish. 2. Heat little bit of oil in a pan and add radish to it. Stir the radish mixture on a medium flame and heat it till the radish become soft. 3. Divide the dough into 20 equal portions. Roll out the round poori sized rotis from it. Spread 2½ to 3 tbsp of radish mixture on one roti. 4. Place another roti over it. Press the edges gently and slightly pat the paratha with your finger tips. 5. Then gently roll the rolling pin over the paratha and remove the finger marks. Repeat the same process to all other parathas. 6. Now heat the tawa/griddle and smear ¼ tsp ghee/oil on it. Place the rolled paratha on the tawa. 7. Pour ¼ tsp ghee/oil on the paratha. Again spread ¼ tsp ghee around the paratha. Shallow fry the paratha till golden brown from both sides. 8. Transfer to a serving plate, apply ghee and serve hot with choice of your side dish. Thank you Sona and Rumana. Thank u Sapana...sambhar powder adds extra flavour and taste to the paratha. Love this healthy parathas very much.. Thanks a lot Tanya..Try this method....and also try, mix and roll thepla method...really very easy. yesterday I too made mooli ka paratha at my lunch.........same texture here, so delicious! very very healthy and delicious paratha :) looks too inviting and tempting me !! Very yummy & delicious parathas...........looks so inviting. Pls do visit my new blog when you get time.